Intrusion Prevention, are we Joking? 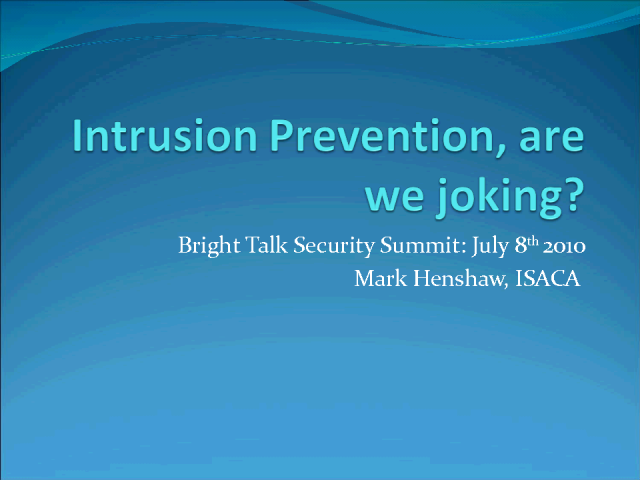 Intrusion Prevention- are we joking? - When your business is a target, can you really prevent sponsored intrusion? - Is defence in depth just a feel-good distraction? - If they want it, then is it just a matter of time? - Elastic Computing or elastic intrusion? - So what can we do to reduce the likelihood? Mark has worked in the Engineering, Pharmaceutical, and Automotive industrial sectors since the mid 1980's both in technical and management positions. Most recently Mark held a senior position accountable for the direction of Information Security encompassing Governance, Strategy, Planning, Policy, Risk Management, and Education and Awareness. He is a serving Director on the ISACA London Chapter board, and Chairman of the ISACA Winchester Special Interest Group. Mark has appeared in print in Computer Weekly, and SC Magazine, he is a CISM item writer, a content author for the CISM Review Manual, and he has presented and shared his experience and knowledge on various special interest groups and expert panels including CSC Leading Edge Forum, Secure IT Summit, BisContinuity, CISO Interactive Panel Infosecurity Europe, and the e-Crime Congress Cloud Forum. Mark holds the ISACA CGEIT and CISM certifications, is a CISSP with (ISC)2, and is a Fellow and Chartered IT Professional of the British Computer Society. Title: Intrusion Prevention, are we Joking?